Simplicity and classic style embody this shirt from Moss London. 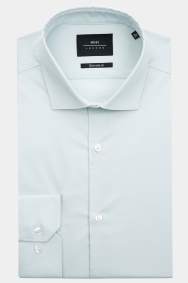 A great alternative to a plain white business shirt, it comes in a subtle light mint green, just different enough to tweak your weekday wardrobe. Made from a cotton and polyester blend, it’s a shirt that’s easy to style and easy to care for. Keep things simple by teaming it with a slim-fit grey suit from the Moss Esq. range, and wear it open necked if you can.